Born to Russian immigrant parents, Benny Goodman exhibited such remarkable musical aptitude as a child that he joined his first professional band at the age of 14. By 1924 he was performing with the Ben Pollack Orchestra, in which he rapidly advanced to the role of featured soloist. In was in the context of Pollack's band that Goodman made his first recordings. The cutting edge of the music scene at this time was in New York, and the ambitious Goodman inevitably established himself there as a top session player for radio and recording. By 1934 he had formed his own band. The Benny Goodman Orchestra had a shaky beginning due to personnel problems, but by the time its first tour reached California in August of 1935 the band had become immensely popular. The show at the Palomar Ballroom in Los Angeles is frequently cited as the beginning of "the swing era", which would continue into the mid-1940s. His popularity with his musicians was not as overwhelming as his popularity with audiences, however, and his uncompromising standards and cheapskate nature frequently led to resentment. 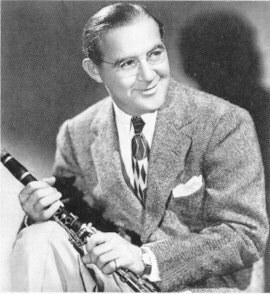 In addition to their effect upon musical styles, Benny Goodman's projects also had a social impact -- being one of the first top bandleaders to use mixed race performers. Skilled musicians such as Lionel Hampton and Charlie Christian featured in many of Goodman's smaller ensembles; his popularity was such that he could remain financially viable without touring the South, where he would have been subject to arrest for violating Jim Crow laws. 1955 saw the release of the feature film The Benny Goodman Story, in which the musician was portrayed by comedian Steve Allen (who, despite his talents in other formats, was not entirely convincing in his mime of playing the clarinet). As is typical with such productions, the film was only vaguely based on the actual circumstances of Goodman's life. Goodman himself remained active in music until his death, becoming more involved in the classical genre in the later part of his career.